Build your own potato box! POTATOES!!! Baked, boiled, fried, or mashed, these versatile tubers are a favorite. You can grow your own potatoes, in a relatively small space, with just a little bit of effort and money. Potatoes don’t like a lot of light and prefer to be root-bound, so even if you live on the dark side of an apartment building, and only have a small balcony, or patio, you can still enjoy your very own, home-grown potatoes! A potato box is a good place to start! For some basic started information you can also refer to this book! There are so many designs and styles of potato boxes out there, but for the sake of simplicity, I went with a square, wood box. The first step is deciding how big you want it. A 2×2 box, 4 feet tall, can grow plenty of potatoes for 2 people. I’m feeding a family of 5, so I went with a 4x4x4 box. Next, you will want to decide what kind of wood to use. Cedar is probably the best wood to use for any gardening structure, as it is durable, weather resistant, and naturally, repels insects. But cedar is expensive, and while it is worth the money, you can do just as well with pine. Whatever your choice, make SURE it is untreated wood. The chemicals they treat the wood with will seep into your plants, and if you are able to grow anything, it will likely be poisonous. For this project, I used pine fence pickets (1×6, 6 ft), and pine 2×4 studs (8ft). Once you have your wood, measure, measure again and cut 4, 4-foot studs. These will be your corner posts. Next, measure, measure again and cut your fence pickets into (40) 4-foot planks. These will be your sides and bottom. If you are putting your box on dirt, you don’t need a bottom, and only have to cut 32 planks (Note: My box is 4x4x4. If you are making the 2x2x4, your planks should be 2 feet long). After you have all your wood cut, attach your planks to the studs. I generally prefer screws over nails, but to each, their own. It is recommended that you drill starter holes in all your intended points of attachment on your planks. Do one wall at a time. Place 2 studs 4 feet apart (from the outside edges). Lay the plank on top of the studs, at the bottom, making sure it is all flush. Once you have everything lined up, you can use clamps to secure everything, and then, attach your plank to the studs. Repeat with 7 more planks, and now you have a wall. Now, build wall 2, doing the same thing. Now that you have 2 walls, attach them, and start your 3rd wall. Line up your plank with the bottom of your walls, once again, making sure everything is level and flush, and attach it to the corner studs. Build your 3rd wall. After you have your 3rd wall, flip the box over so you can start on the 4th wall. Line up a plank on the bottom and one at the top of your 4th wall, and attach them to your corner studs. Now, here is where the 4th wall is different. Instead of attaching the planks on this side, we are going to drill holes where the attaching screws (or nails) would go. You want these holes BIGGER than the heads of the screws (or nails) you are using. Then take a plank, line it up in place, starting at the bottom, and mark where the holes in your plank are on the studs. Put the plank to the side. Drive a screw (or nail) partially into each of the marks, at a slightly upward angle, so that your plank will slide onto, and be held in place, by them. Take your next plank, and do the same. Repeat until you have your 4th wall. If you are putting your box on dirt, or open ground, you are done building your box and can begin planting. If you are putting it on concrete, use the remaining planks to build the bottom. Get seed potatoes, or let the ones your pantry go to root. Once you have good roots plant in your potato box. Potatoes like dark, warm, and mounding. So when you plant them, cover them well. 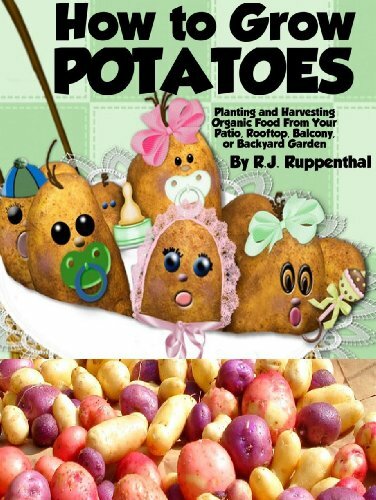 Potatoes can grow in anything even newspaper but they will take the nutrients they have. So if you are planting in scrap newspaper, you will have that nutritional value. What we do, is start them in good soil, then cover with leaves. When they plants are two inches above the leaves, we cover with mulch, compost etc. Every time the plant is two inches above, we layer more stuff. We alternate leaves and mulch. Have you used a potato box before? Let us know your results!